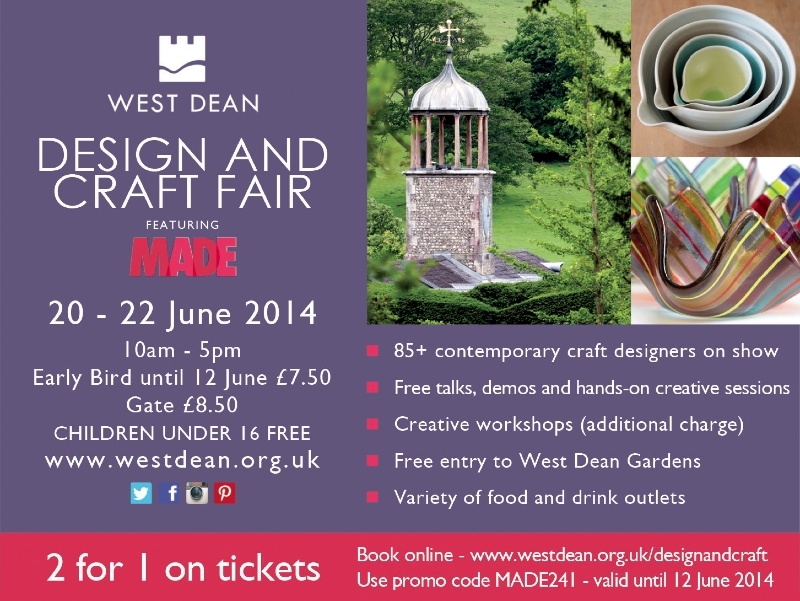 I will be shortly exhibiting at a new craft fair taking place at the beautiful West Dean College in West Sussex on the 20th-22nd June – the West Dean Design and Craft Fair 2014, being run by the team that organise the high quality London and Brighton Made shows that I have exhibited at before so it should be great! And get a great 2for1 offer here – 2 tickets for the price of 1 using the code MADE241 until 12th June. The West Dean Design and Craft Fair will feature around 85 innovative makers and designers who will show and sell their work to the public. Alongside the Fair, visitors can enjoy hands-on taster workshops and demonstrations in contemporary art and craft run by the College. They are running this event in collaboration with the team behind the highly successful MADE London, MADE Brighton and the Brighton Art Fair. They’ll call on their experience to bring together an eclectic mix of talented exhibitors for your enjoyment. Ticket price includes entry to the award-winning West Dean Gardens and plenty of delicious food and drink options will ensure visitors don’t go hungry! You can purchase tickets in advance for £7.50 and £8.50 on the door which is great value as the normal entrance fee to the gardens is £8.10!